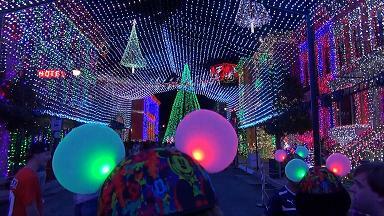 Special effort was made to get to this final season of The Osborne Family Spectacle of Dancing Lights at Disney's Hollywood Studios, FL. It was well worth it! Having not been there before, I was blown away by what I saw. 'Spectacle' is an accurate description. Wikipedia has a nice write up on this. They report it takes 20,000 man hours to setup and consumes 800,000 watts of electricity per season. Simply incredible. Beginning with 2013, the show now includes support for Made With Magic (MWM - formerly called Glow With the Show) devices. That development brings together key elements that have drawn a variety of folks, often with diverse interests, to the Made With Magic (MWM - previously Glow With the Show) devices sold by Disney Parks. For those whose main interest is the MWM infrared codes, and how those control the MWM devices, recording these shows provides another glimpse into such codes and the context for their usage. Perhaps more insights for how to make the devices do your bidding! For others, the Osborne MWM recordings provide additional MWM shows that may be collected, synced to existing music/recordings of the event and enjoyed once again at home. The fun doesn't have to end just because you're no longer in the parks. No, you needn't regret that impulse purchase you made back in the park when you're unpacking it from the suitcase back home. Nor will you need to relegate the devices to their hiding place on that top shelf in the hall closet - never to be seen again. They're still useful. But this isn't just any Disney show, it's a Disney Christmas show! That makes it particularly interesting to those aficionados looking to incorporate MWM devices into their own Christmas light shows. It gives a glimpse into how the creators of MWM imagine that might be done. For those who have already incorporated some of these 'dancing' musical segments of the Osborne Family show (or are planning to do so) into your own Christmas displays, the recordings of the MWM codes from those segments might give you a great head start on extending your show to include those MWM devices. Follow those links for more info on each of those segments and to access the MWM recordings. Most have, at least, one MWM recording attached. However, the ones with an asterisk weren't performed while I was there so, unfortunately, there isn't an IR recording for those. If you happen to have a recording of the missing segments, and would be willing to share, I'd be very glad to add your handiwork to complete the collection! I've included a YouTube video on each of those segment's page. Whenever possible, the ones selected are those with MWM devices present, not necessarily the ones that might be the most visually appealing or with best audio. Hopefully, the videos will help folks recognize the versions of the audios used in the show and facilitate syncing the IR playback to the audio/video. It's always interesting to see how other groups setup and run their shows. This video gives the flavor of the shows. The 'dancing' segments don't run continuously nor, apparently, do they simply loop through a set playlist. There are 'intermissions' of 2-8 min between the performances and 11 songs to present. Each 'dancing' song is roughly 3 min long. I figured it would take about 2 hours to go through the whole list once - roughly the length of time the show runs most nights. Should be able to experience the entire program by getting there at the start and staying to the finish. But that's not what happened. Some songs began repeating before the entire list was run once. Consequently, I have as many as 4 recordings of some segments and none of a couple of the others. At this point, the strategy for playlist selection is not clear. During the gaps, or 'intermissions', the level of the light's automation was minimal. The majority of the lights were static while upbeat songs played continuously, 'broadcast' from a fictitious radio station. The MWM devices relied heavily upon two or so basic patterns during these intermissions. The most common interim MWM effect was alternately flashing red and then green. You can get more info about those intermission sequences by clicking here.